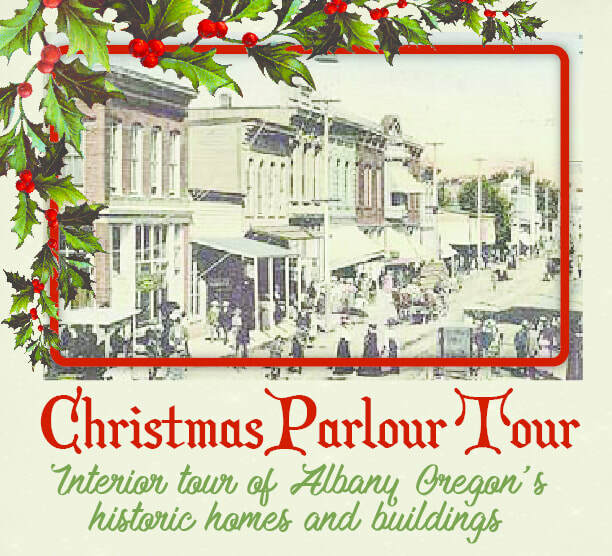 Enjoy the sights and sounds of an old-fashioned holiday celebration in Historic Albany, Oregon. This year the tour will feature six historic homes decorated for the holidays. Along with the homes on tour, you may visit the Whitespires Church (1891), United Presbyterian Church (1912-13), Albany Regional Museum (1887), Monteith House Museum (1849), and Carnegie Library (1914). ​Father Christmas will be out and about with his bag of treats. The Monteith House Museum will be lit by oil lamp and fire light. Take a moment to enjoy the fire lit in the Carnegie Library. It is the only time all year this fireplace is lit and it creates a soft warm glow that transcends time. Whitespires Church encourages visitors to ring the bell. Light refreshments included in ticket price. Chafin Farms horse-drawn wagon will take you through the Historic Downtown District, and the vintage trolley will be making rounds as well. Pre-sale tickets are available now through the Albany Visitors Association. Click here to purchase. Purchase your tickets at the Albany Visitors Association 110 3rd Ave SE in Historic Downtown Albany. Ticket sales begin at 1pm and continue until 6pm. The tour hours are 2pm to 7pm. Music, refreshments, horse-drawn wagon rides, and vintage trolley rides are all included in the $15 ticket price. Well-behaved children under 12 are admitted free with a paid adult. Proceeds benefit Monteith House Museum. This tour is self-guided. You can tour the homes in any order you like. Spend as much or as little time at each location as suits you. Transportation is by your own vehicle, by horse drawn wagon, and vintage trolley. Several of the buildings are within walking distance of each other. A few may be outside your comfortable walking distant requiring your own vehicle for transportation. Visitors usually take 3 to 4 hours, sometimes more. Come a little early for some holiday shopping! Find unique gifts in antique & specialty stores, taste holiday treats in one of the many eateries in Historic Downtown Albany. There will be a list of the downtown shops and restaurants open on tour day at the Albany Visitors Association. Gallery Calapooia will be open on Sundays from 9am until 1pm through December 17 to accommodate holiday shoppers. Be sure to mark your calendar for the Summer Tour of Historic Homes and Buildings, held the last Saturday of July each year. The 2019 Summer Tour will be held July 27, 2019. Albany’s Annual Interior Tours were created by a group of friends and neighbors to share the past through the architecture of historic dwellings. They are coordinated by Albany’s Historic Interior Home Tour Committee and sponsored by the Monteith Historical Society.